Looking back between the years of 1930 and 1960, there were certainly a lot of monumental world changes during that small glimpse in history. 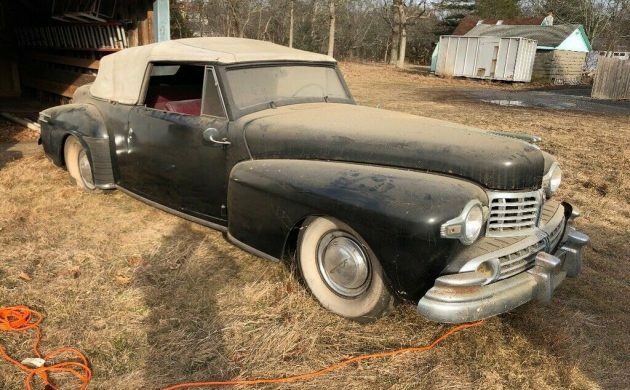 This 1948 Lincoln Continental convertible could be a note in that history, and you can own it. No VIN or miles are listed but there is a clear title to the car. It currently resides in Quogue, New York, and the current bid price is at $10,000. You can view more on eBay. The listing states that it is a barn find with a freely turning motor, but it will need to be towed home. 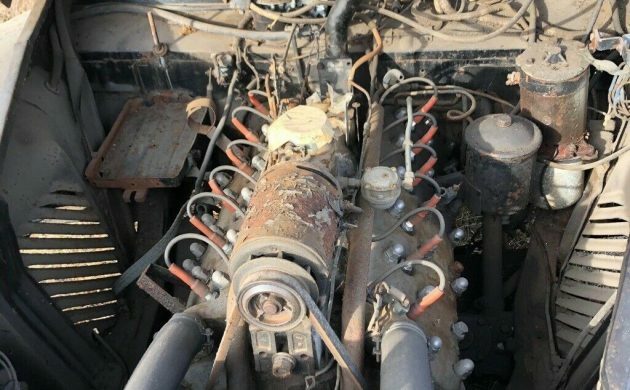 Even though the 292 cubic inch straight 6 engine doesn’t fire, it is still a beautiful engine connected to a more beautiful car. Thankfully, there is a photo of the engine. The transmission should be a three-speed manual, which would be a three on the tree. This car looks like it was well taken care of or potentially restored at one point. Inside, while there is only one picture, it is very valuable, showing some of the front seats and dashboard. 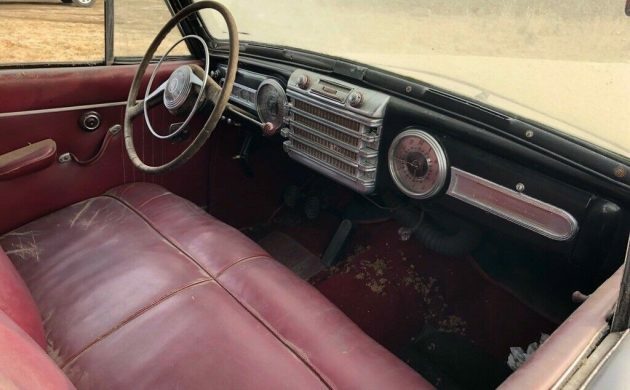 The seats look like they are in very good condition and the dashboard shares the same status. It is hard to believe that the convertible top has not decayed and ruined everything. Someone must have taken very good care of this car and stored it inside. According to the listing, it had been in storage for 15 years. Before that, you will have to ask the seller, if they know. Nothing in the listing indicates that it is all original. It simply states that all the pieces and parts that need to be there are there. Whether or not this car is all original or not, nothing can take away from the fact that it is a beautiful example of when cars were big, bold, and beautiful and representatives of a time when things were starting to get better. Looks like a V12 to me. A twin-plug “six” with two L-heads! These are gorgeous cars when restored and thanks to Edsel Ford for developing the Continental. I would replace the drivetrain though, didn’t these V-12’s tend to overheat? There was one of these in the town I grew up in. My dad told me that the car had a different engine in it rather than the V12. He said that it had an engine failure, common to that model That was in the late 50’s, I was about 9 years old and can still remember that car, it was a light blue or grey. True and not much hp for a car that large. Yeah, but, it rode like a dream. These were luxury cars, not hot rods. Flat heads were the main things those days. The car Sonny was shot in in “The Godfather” was a 41 Lincoln Continental. Yes it’s a V-12, the so-called “Wee-Twelve” from the Zephyr. No, they don’t overheat. We drove thousands of trouble free miles in them over the years, especially in the 70s and 80s on CCCA Caravans. Don’t lug them- they don’t have the torque of a Packard Twelve. Use all the gears including overdrive in second and third and you’ll do fine. leave the gun—take the cannolis…. Beautiful car. Looks like insulation on the carpet over the transmission tunnel? Maybe mice..
Like……and nice save of it there. Taking delivery of an identical Lincoln Cabriolet tomorrow- traded my ’83 El Camino and some greenbacks for it. Modernized with an SBC 350, Turbo Hydramatic 350, Mustang II front end with discs, etc. Since it came out of a barn, maybe BF would like to do a feature? Fred W, did you get that car in Tennessee? Been one altered in a similar way for sale here that seemed very nice for the price. I did! Did you have a look at it before I bought it? Any observations appreciated. Working out the kinks in it as we speak. with a tan top and a red leather interior. What is the motor next to the oil filter for? I believe it runs the hydraulics for the top and power windows. Come home to Daddy!! I MUST own one of these someday. I think they are so beautiful and they are usually priced so I could afford one. A lot of car for 10 large. I’m going to be the contrarian here. Not a fan of the looks of the original and the grill on this model doesn’t help. And beam axles and cart springs at both ends? In 1948? Pass. Sure, it’s got potential, and at least the V-12. I will disagree with you on the automobiles design. My opinion is that this car is one of the most beautiful ever designed. BUT I will certainly agree with you on the old fashioned and throughly out of date chassis and suspension system, both front and rear. To have such a great car resting on just TWO transverse leaf springs seems hard to believe! Doesn’t that design go back to the Model T’s? This is quite a find. Somebody knew to stash one of the nicest cars made. 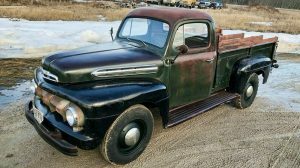 Again, would love to know the story, I mean, it’s not a ’48 Ford. Probably, the most expensive car one could buy after the war. Being that, it may or may not have such a rosy past. Beautiful car. 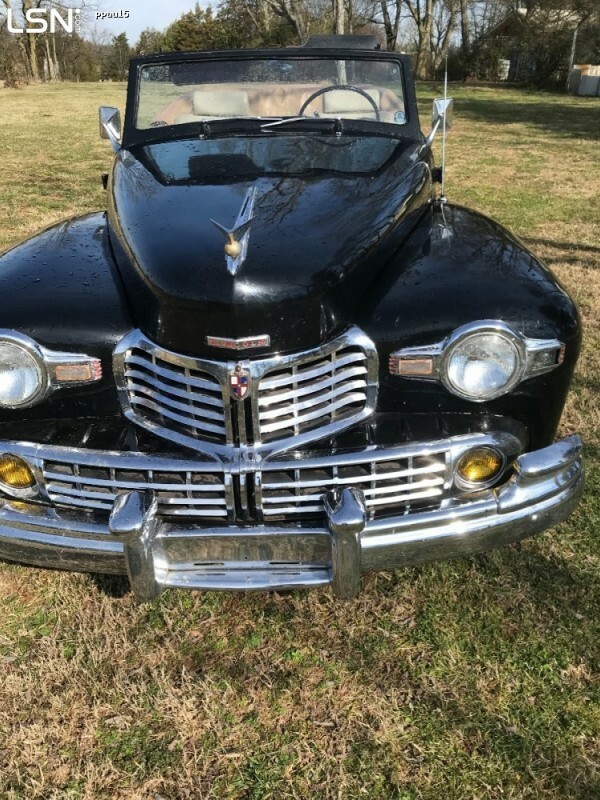 I found a 1948 convertible just like this one back in 1977 in a rich old lady’s garage in Bratenahl, Ohio. 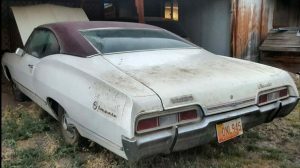 I was 15 and trespassing, because I could see a neglected, stand-alone garage from adjacent property and was convinced there might be a cool car in there. She eventually let my dad and me see it, and it was pretty rough, but it was magnificent. 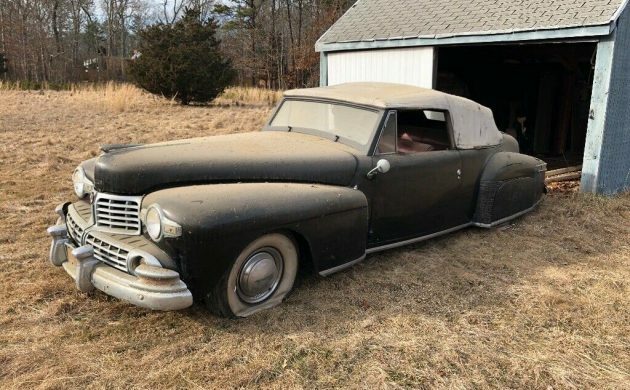 That garage itself is long gone now, and I always wondered what happened to “my” ’48 Continental! It was sea-foam green, in case anybody has a clue. 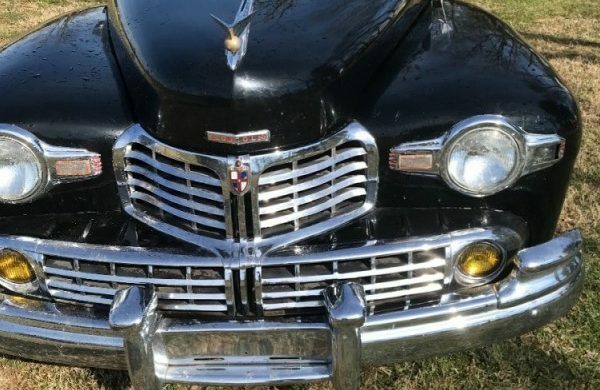 Funny; in that movie, the cop putting out the “APB” on Baby Jane Hudson was saying to ‘be on the lookout for a black `41 Lincoln”! They couldn’t even get it right in the movies! This is one classy and sleek car. Wished I could take it in, but same old obstacle, storage until this spring! I really hope that the new owners bring it back to what it is! About 30 years ago I was chief judge in the post war Lincoln class in the second best concours in California. The rest of my team and I were judging four of these 1948 convertibles. When I went to tally up the score sheets from all the judges, two of the cars were tied for first. I could have declared one the winner over the other and that would have been that. But , no. I had to go back and break the tie. Going back to the cars without my judges jacket and badge I had to honestly find something to change the score. The car owners sitting behind their cars did not recognize me, and it was a very busy day. I looked and looked at everything again. I found something, small but allowable. One car’s dash clock was not working. That was it, I completed my score sheets and turned them in. Later in the day I ran into the second place car owner. He asked me what had made the difference. I told him, and he understood. 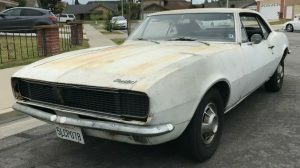 I past concours I have had several car owners not as understanding. Well, if one wants to win…. details, details, details. 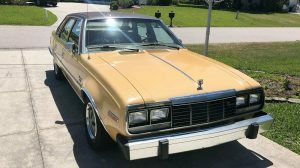 Hey, with all the cash going down for this beauty, I want this, small flaws are what make this a car instead of a museum piece. I had 2.375 seconds left. Come on guys. I was trying to say: No matter how high this beauty goes, It’s value is going to be exactly what the bidder chooses. Bidding at $14,680.00. Two people are going to get it right. Seller and buyer. Too much money for me. But, these are valuable cars. I’ve always loved them.